There are 100’s of games which try and take the core ‘21’ concept of Blackjack and jazz this up a little. Most simply add side bets (many with a huge edge in favour of the house), while others complicate the rules to the point of ruining the original game. When you play Blackjack Switch you’ll immediately realize that this is one of those rare exceptions – a Blackjack game which adds new strategy and game-play without ruining the part that made the original game so popular in the first place. Here I have explained how Blackjack Switch works, where you can play this online and then mentioned some of the other variations on this theme which I believe stand out in a crowded field. The core difference between Blackjack Switch and regular Blackjack is that you get dealt 2 hands in Switch, and can swap the top cards between them. Both of these hands then play against the dealers single hand. You can swap over the top cards here to make one Blackjack hand, and one 10. If the dealer in this hand is showing a 5 (for example) then you have a great opportunity to double down. 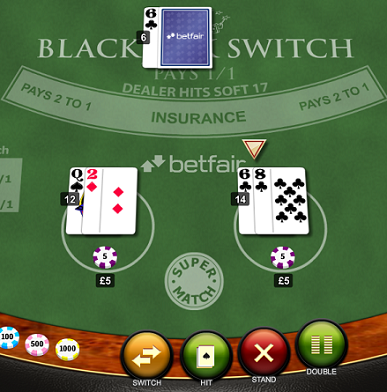 With the dealer likely to make a hand, a solid beginner strategy in Blackjack Switch is to go for the single best hand. In this case swapping gives you a 12 and 20, not an ideal outcome, though much better than having to grit your teeth and hit on two separate 16 hands, which you would have done in a regular Blackjack game. Being able to switch gives the player a big advantage, which of course the casino needs to take back in some way or another. This is done with the ‘Push on 22’ rule. If the dealer busts on exactly 22 points, the hand is considered a tie against any made player hand except for player Blackjack. You should also note that Blackjack pays 1:1 and not 3:2. This small difference alone makes up a big chunk of the advantage which the ability to switch brings you. Overall, these small negatives are balanced by the extra interest and entertaining game-play you’ll get from being able to switch. The strategy is deeper than it looks at first glance, and some famous players have even dedicated chapters of their books to the math behind it. Most switches are obvious, and the ‘best single hand’ works 95% of the time they are not! This game is not available at any US friendly casinos at the moment. For international players, PlayTech have an excellent version of this game – with minimum bets at $1 and max at a huge $2500. As always, I recommend that you stick with the biggest and best brands, and in this case BetFair is the casino to hit. You’ll get a welcome package which includes as £ / $ 150 bonus, 10 free spins on live Roulette and often some free slot spins too (this changes, keep an eye on their website for the latest promos). What I like best about BetFair is the way that they look after their loyal players, no other international casino offers the selection of games or promotions that you’ll find here. Check out www.betfair.com for yourself now! This is one for US readers, and is available at the Bovada Casino. Zappit works on mobile devices as well as PCs and has a unique ability to ‘Zap’ hands you do not like, at least when they are 15, 16 or 17. Already a huge hit, I am looking forward to this one expanding out of the US. How would your strategy change if you could see both of the dealer’s cards instead of just one? Well, you’d have to hit on 19 sometimes for a start! This game is fast-paced, and often frustrating, though it does add a new angle to the old Blackjack theme. You can now play at a table with other people with a live dealer handling the cards from a remote studio. This adds a social element to the game, as you can chat with the dealer and the other players.